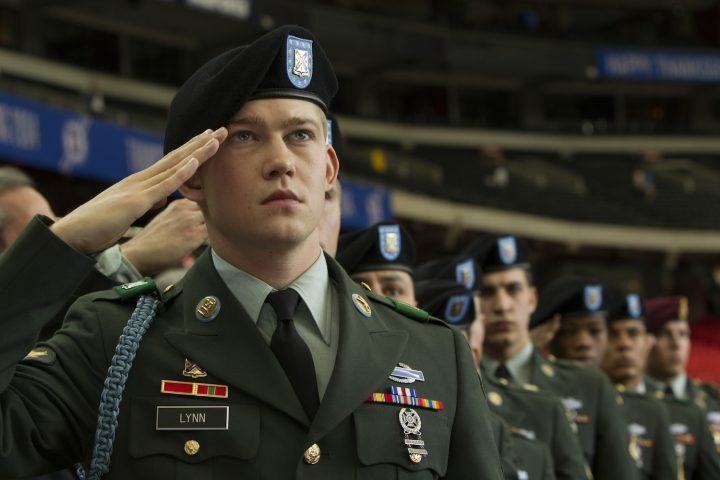 Buried underneath Ang Lee’s and Jean-Christophe Castelli big screen adaptation of Ben Fountain’s novel Billy Lynn’s Long Halftime Walk is a poignant and bitter story about comradeship, patriotic fervor and about how that fervor is exploited. But, alas, Lee’s insistence in shooting this film in 3D, 4K and at 120 frames per second in an attempt to create a more immersive, you-are-there experience, has robbed the story of its emotional, gut-wrenching impact. And for what? Only a handful of theaters in New York and Los Angeles are equipped to screen it in this format; the rest of us mere mortals will have to do with the standard 2D (the way I saw it) or 3D version projected at 24 frames per second. In fact, the film’s flaws are more apparent in the traditional format; it showcases how technology sapped the story of its soul. The story follows Billy Lynn (newcomer British actor Joe Alwyn) and the members of the ethnically diverse Bravo Squad back home from Iraq for Thanksgiving, weeks after George W. Bush is re-elected and months after the Abu Ghraib scandal explodes. Billy has become a media sensation after he is captured on camera rescuing his mortally wounded superior officer (Vin Diesel) from an insurgent’s attack and killing that insurgent. They are welcomed home as heroes and the Dallas Cowboys have invited them to be part of their halftime show featuring Destiny’s Child while a Hollywood producer (Chris Tucker playing it straight for once) tries, in vain, to sell their story to a major studio before the Squad is shipped back to Iraq. It’s quite a disorienting and overwhelming 24 hours for Billy and his comrades. At home, Billy has to contend with his mother’s adulation, his father’s indifference and his sister Kathryn’s (Kirsten Stewart) adamant opposition to the war as she tries to convince him to get a dishonorable discharge. At the stadium, they are met by a garish circus of admirers, cheerleaders, event producers, businessmen and the W.C. Fields-like owner of the Cowboys (played by a dry, pompous and rather inert Steve Martin). Each sensorial experience triggers in Billy a specific memory, taking him to the days prior to that “heroic” event. By the time the halftime show begins and Billy and the Squad’s surviving commanding officer Sgt. Dime (Garrett Hedlund in a delightfully droll and sarcastic performance) tell the owner of the Cowboys where he can stick his offer to finance the film, we can guess the story’s final outcome. “This is our country and I fear for it. I think we should fear for it,” says Dime at one point, and even though that seems incredibly prescient given when the film was shot, for these men, home and country is not where the heart is given the bond that ties them together. I wish the film was as good as that synopsis. Critics’ reaction was mixed when Billy Lynn’s Long Halftime Walk premiered at the New York Film Festival; most found the high frame rate distracting, gimmicky and a mess. And the images do not translate as well to the regular frame speed. Faces are framed center stage, staring directly at the audience; shot at a high frame in 3D should, technically, provide the illusion that the character is addressing you directly; at the regular speed, the framing is at best awkward, at worst amateurish, forcing you to turn your gaze away from the screen (Chilean filmmaker Pablo Larráin uses the same technique far more efficiently, and confrontationally, in his upcoming Jackie). The camera movements, especially during the crowd scenes, are downright shoddy and blurry, surprising given that the director of photography is none other than John Toll, who’s delivered some amazing images in films like The Thin Red Line (1998) and Braveheart (1995). The halftime show, the film’s centerpiece, is, frankly, one of the worst choreographed large-scale sequences I have yet to see. It’s hard to believe that this film was made by the same man who gave us such finely calibrated masterpieces as Crouching Tiger, Hidden Dragon (2000) and Brokeback Mountain (2005). No technical innovation can hide the film’s many flaws, among them the wooden acting by most of the cast. According to the production notes, to achieve his desired level of verisimilitude, Lee asked his actors to behave as much as act, to live their roles in order to express the nuances he sought. But their attempts at high definition acting fail; their so-called naturalism feels forced, artificial. Kirsten Stewart is the one actor, besides Hedlund, who rises above the technical gimmickry and Castelli’s wooden lifeless script to deliver a performance full of nuance and warmth. You could even argue that they are both defying Lee’s call to keep it natural and that, by actually acting, they are grounding the film, breathing life into it. As far as I am concerned, it’s back to the drawing board for any attempts at shooting a film at a higher frame per second. There are some things that technology might never make up for or replace: and that’s a good story and great acting.